Never thought that Easter Bunny post would be so successful! 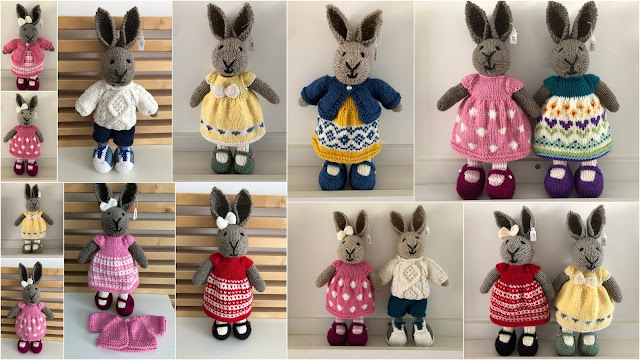 I have been knitting overtime lately, I did more than 30 bunnies and also sold some extra dresses and cardigans. 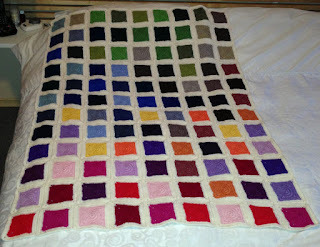 I'm going to take a little knitting break now and I'll be ready to start on some different stuff in a couple of weeks! 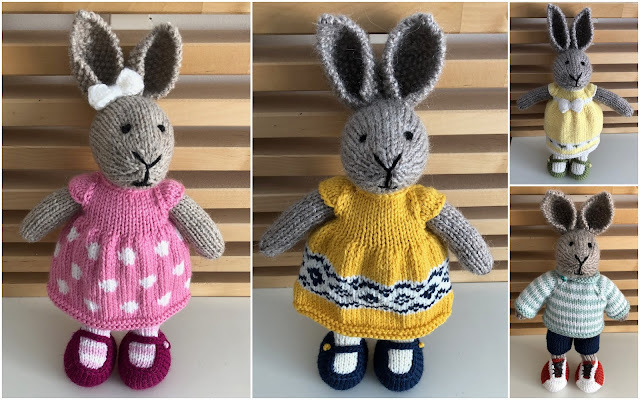 This Easter, instead of buying chocolate bunnies, why not get a much "healthier" and longer lasting gift, a hand knit bunny, dressed in clothing of your choice. Extra clothing pieces available. As a kid, the thing I liked most was changing clothes on my dolls and that feeling hasn't changed much since then. 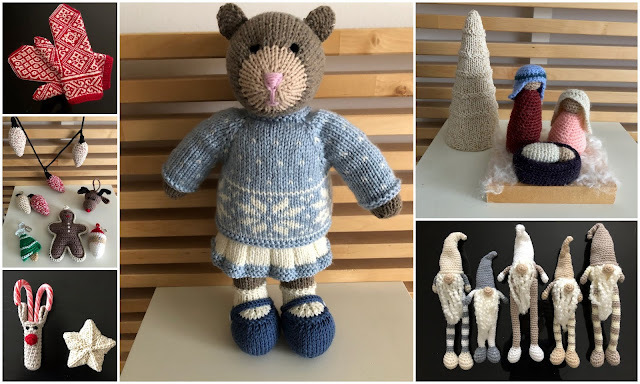 One of my favourite things to do is making new clothes for my knitted animals. 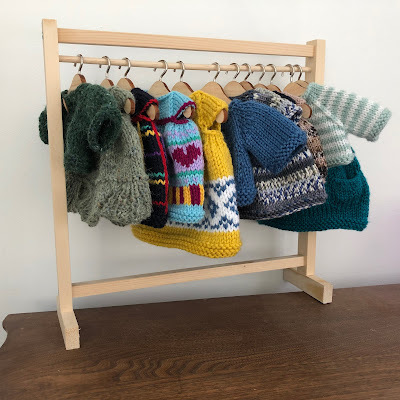 Since I got myself a little clothes rack to fill it has never been empty and gives my costumers a choice what kind of outfit they want. And I can adjust according to the season, Christmas clothes, Easter clothes, summer clothes. Right now I've made some cute Valentine outfits, in red, white and pink and with hearts of course. Santa Claus is in town and I've been very busy keeping Michelle's clinic supplied with Christmas crafts. Things are selling well and also orders to fill (5 gnomes in neutral colours). I'm working several different projects at the same time and my work area looks very messy with lots of yarn, needles and other equipment laying around for easy access. Pinterest is a hard place to stay away from and every time I end up there I see more things I'd like to make. Below a small example of the things I've been working on. Most patterns are found on Pinterest or Ravelry. The Gnomes are my own design. Just LOVE this design, looks very complicated but actually much easier than I figured. This one is going to someone else as a birthday gift, but I most likely will make another one for myself. Have enough of the yarn leftover. The colour doesn't come over as nice in the picture but it's a very soft rose blush, with a little bit of fluff but not itchy! I have some new favourite patterns! I just wanted to change it up a little after making so many of the Little Cotton Rabbit animals. As you can see, these ones are very cute too. The mouse is a little smaller and the bear is bigger than the previous toys. But I'm sure I can adjust some of the clothing to fit anyone of them. And here is a bigger girl bear too! I have a small display at Serenity Now Massage Therapy so if you are in the St. Thomas area you can go in and see (and buy!) some of my creations. I know it's not Christmas yet (too hot right now to even think about winter!) but I'm always working ahead of the season. I'm pretty pleased with the result and I think I'll make some more later to sell at Michelle's clinic for the upcoming Christmas season. I've been working on a pair of baby booties for a while now. I wanted an easy design without any seams and also the possibility of making it into a different bootie without changing too much in the design. I think I finally got it done. 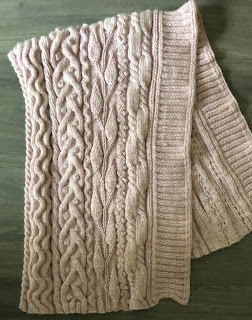 I'm pretty pleased with the result and I feel anyone who likes to make baby booties can use this pattern and with some fantasy should be able to make a lot of different styles for any occasion. Persian Dreams blanket all done! I'm VERY pleased with the result, it really looks gorgeous. I redid the whole outer edge because I wasn't happy with the first one. An extra week of work but worth it! and where I got the idea to make one myself. I used 2 round boxes as filling, so it keeps the shape well. I enjoyed that very much. It actually went surprisingly fast. Took me just about 2 months to finish the whole thing. I'm ready for my next project now.